Things have been pretty fast and furious around here, so we scheduled some time to strike out for an afternoon of bowling fun. But, then we got even busier and had to postpone our fun for a bit because, well…split happens! Our two teams went through a highly selective recruiting process: 1. They work here. 2. They either work upstairs or downstairs. Our boss Colin was a floater/ringer who evened out the teams with his ‘I-was-almost-a-pro’ bowling prowess. 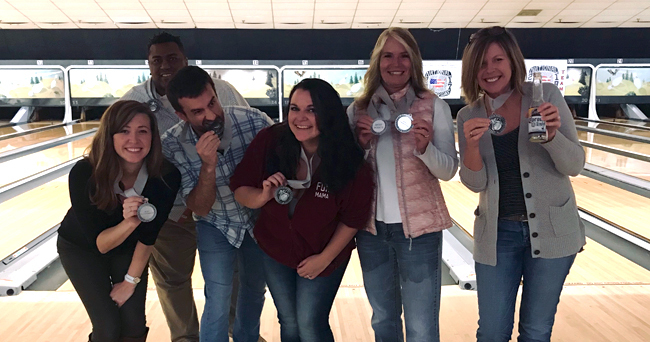 We made some lucky strikes (well, actually, they were mostly gutter balls), enjoyed some refreshing beverages and handed out some awards, including our favorite: Most Dangerous Bowler. As we reported earlier, we can still vouch for the fact that: “A designated time for employees to take their minds off of work and enjoy themselves ultimately results in happier team members.” And, you never feel closer to your teammates than when their strike helps your floor win the grand prize!